What are the nocturnal habits of your family members like? Do you lounge on social media during the wee hours of the night? Are your kids setting their own schedule, then struggling with awakening and preparing for school each morning? Does your partner settle onto the sofa for late night sports and news programs, then hit the snooze repeatedly the next day? In order to be physically and mentally healthy, we all need to get a good night’s sleep. Sometimes, we believe once we’re adults, we can run on caffeine and candy bars. However, sleep is necessary for mental and physical wellness, regardless of how old you are. The Sleep Foundation points out when we sleep, our minds and bodies experience restorative processes and rejuvenation. It’s also when our brains sort through our experiences from the day to organize and store information. For instance, children especially benefit from adequate sleep when they are preparing for testing in school. Without enough sleep, we are at an increased risk for health issues such as diabetes, heart disease, depression, and obesity. Our sleep requirements do appear to decline somewhat throughout our lives, with infants needing the most sleep and elderly people needing the least. But to stay happy, healthy, and performing our best, we must optimize our slumber. This means tending to our sleep environment and habits. Your bedding can greatly impact your sleep quality. If you or your family members have the wrong kind of mattress (latex, hybrid, innerspring, etc.) for your individual sleeping style, an older mattress, or a poor quality mattress, replacing it can mean better health and quality of life. Age, lifestyle, and issues such as back pain should be taken into account for mattress selection. Generally speaking, the rule is to replace a mattress every seven to 10 years. However, since many people opt to purchase mattresses and foundations online, you should research reviews and pay particular attention to trials, warranty information, and return policies. While beds are the center of the bedroom, there is much more to consider when designing a good sleep environment. You should ensure your family members’ bedrooms are quiet and dark for sleeping. The room should be cool but not cold, comfortable, and free of distractions. Blackout curtains help sleepers sensitive to light, and white noise machines can help soothe those subject to street noise or who hear televisions in another part of the house. Note the blue lights from electronic devices can be disruptive to sleep. Both children and adults can experience trouble falling or staying asleep if they interact with a cell phone, tablet, or television prior to bedtime; keep bedrooms free of electronics for the best results. You might be surprised to discover how much habits and schedules affect sleep. For instance, setting and sticking to a bedtime is good for us at any age. Dozing off in front of the television, feeling groggy during your workday, or relying on caffeine to make it through your commute are all signs you should improve your sleep habits. 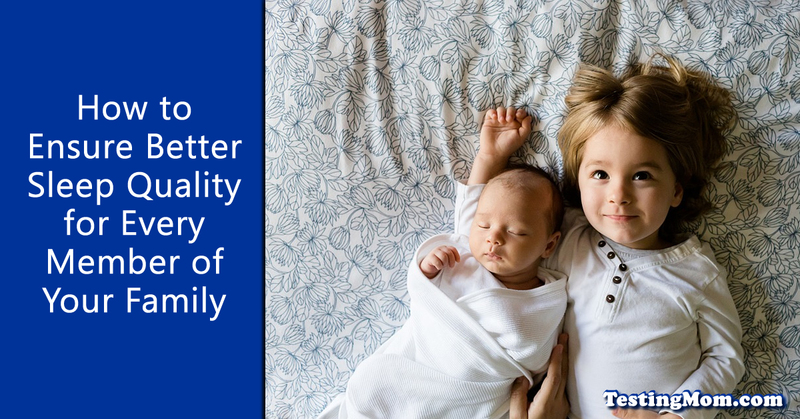 Scheduling a bedtime and awake time is important for every member of your family, from your youngest to oldest. This especially holds true for children throughout the year, though particularly during the school year when they need to be mentally prepared for schoolwork, tests and being an active participant in class. Poor sleep can critically affect a child’s grades fairly quickly. It’s also important to exercise, but keep vigorous activity early in your day and avoid exercising in the few hours before bed. Make sure your family members avoid eating too much at night as well. Many people enjoy a bedtime snack, and teens can be particularly ravenous with their growing bodies and changing needs. If a bedtime snack is necessary, Today’s Parent suggests trying food that appears to encourage drowsiness, like a banana, toast with peanut butter, or some yogurt. Getting a good night’s sleep is a key to proper health and performance no matter how old you are. Provide an appropriate mattress and environment, and check everyone’s habits. Ensure you and your family members enjoy good slumber for the best quality of life.